The fourth-grade students laughed as the pile of pine blocks cascaded to the concrete floor, making a clattering sound that resonated throughout room 120 of the University of Virginia’s Rice Hall. Their tower had tumbled down after they removed blocks representing fractions, destabilizing the structure. 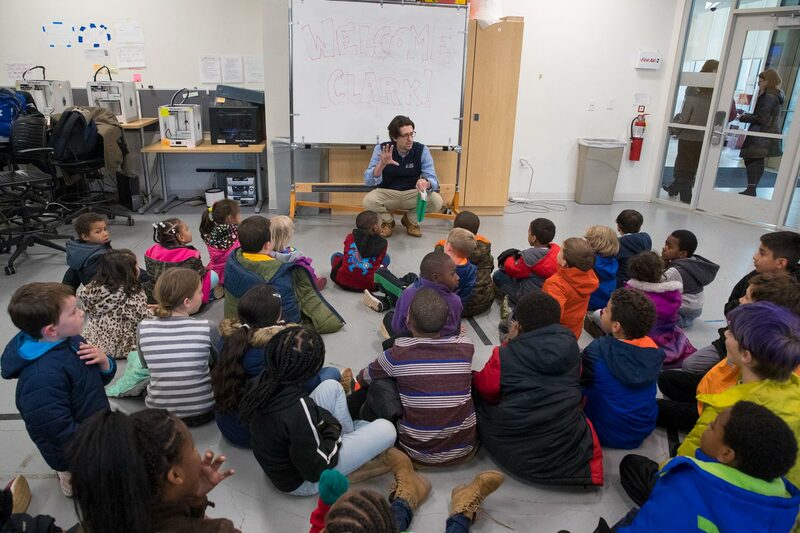 The youngsters from Clark Elementary School in Charlottesville were part of a group of elementary students who were “play-testing” fraction-teaching educational games designed by first-year engineering students at the University. Similarly, a group of Clark kindergartners went to room 242 to test counting games. Engineering professors Reid Bailey and Greg Lewin’s students designed the games during the fall semester, getting input from the elementary students along the way as they refined the toys. Lewin’s students spent the day at Walker Upper Elementary School, where fifth-graders tested systems for learning about food webs and energy transfer in ecosystems, the seasons and phases of the moon, the solar system, potential and kinetic energy, the symbiosis between bees and flowers, and trophic layers in the oceans. 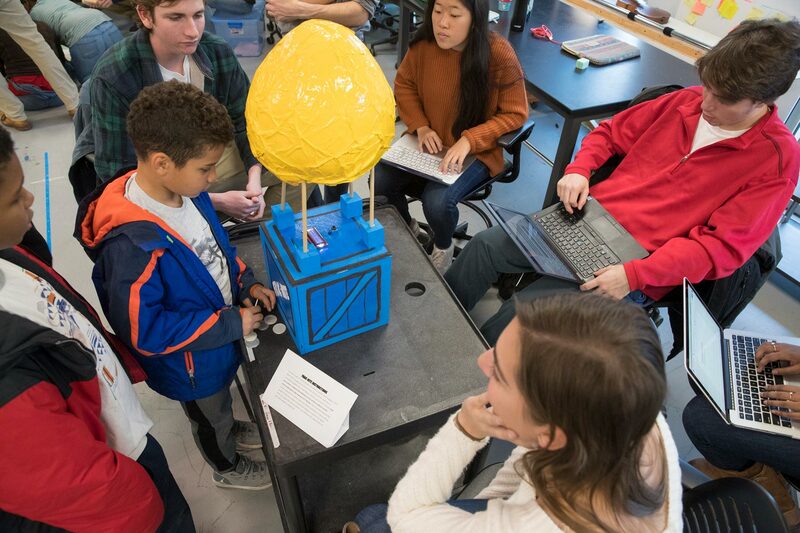 Frances Astorian, a first-year engineering student from Frankfurt, Germany, was part of a team that built a beanbag game called “Toss & Solve.” Students ponder a math problem and, if they get it correct, they toss the "cannonball" (a beanbag) at a "castle," reducing the health of the castle until it falls. “It is rewarding to see them having so much fun,” said engineering student Grace Park, whose team worked on a fraction game where fourth-graders find the common denominator and then insert coins to determine the numerator. When the fourth-graders got the answers correct, they broke into a dance. The first-year engineering students also learned teamwork. But also important are the people skills, such as being able to look at their designs and templates through the eyes of a fourth-grader. “We are recreating the professional world in the classroom,” Astorian said. Melissa Powell, a fourth-grade teacher at Clark Elementary, thought it was amazing for the fourth-graders to be able to come to Rice Hall and see the engineering facilities, to give them a glimpse of what could be possible. Powell, who had 14 students at Rice Hall Thursday, has worked with Bailey for several years on this collaboration, which she said benefits both age groups. “It is a fun way to get a review of fractions,” she said. The fourth-graders divided into groups and rotated around the room, spending time on each game. Bailey asked them to rate the games based on how much fun they were. While the fourth-graders played the games, the engineering students took photographs of them on their mobile telephones and recorded data on how well their design performed. He said the engineering students, who must give a final presentation on their team projects, had been looking forward to the play-test, but also were anxious that their designs succeed with the fourth-graders.